This gecko is handmade in Haiti from recycled oil drums. Each has a small hook to hang the piece and is painted with a bright colorful design inspired by the local Hatian culture. From head to tail, the gecko is 8 inches long. 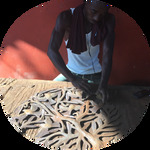 Founded in 1990 by a multinational group of young entrepreneurs, Caribbean Craft promotes employment in Haiti by training unskilled craftspeople, and by assisting the independent artisans through the introduction of new designs and new market outlets for painted Haitian metal art. Caribbean Craft's specialty is the brightly colored, artistically hand-painted Haitian metal art wall hangings. These hand-painted Haitian metal art pieces are truly works of art. Wall art designs include painted metal geckos, painted metal dragonflies and painted metal frogs. Copyright © 2019 Global Handmade Hope - Fair Trade Gifts. Shop for ethical unique, handmade gifts from around the world including fair trade baskets, jewelry, crafts and other items from international artisans.